Secondary school league tables for England show that 470 schools were below the government's "floor target" for pupils' exam results last summer. Thirty-one have now closed. But more than 160 previously on this National Challenge "hit list" have improved. Unions denounced the government's "arbitrary" targets, while the Tories said Labour was failing to deliver. Overall less than half of pupils (47.6%) achieved five or more grades A*-C, including English and maths. The tables reveal there were 94 state and independent schools where all the pupils who sat their GCSEs and equivalent exams last summer attained this benchmark, regarded as the key to further education or employment. The best was Lawrence Sheriff boys' grammar in Warwickshire whose 89 students had an average points score of 792, which equates to more than 13 A* grades apiece. Head teacher Dr Peter Kent said the success was the culmination of 10 years' work and was not just a "one-off". He said there was a culture of high expectations at the school, with a personalised approach to each student. The worst maintained school was Parkside Community Technology College in Devonport where only 5% of the 37 pupils achieved five good GCSEs. The school has now been closed, its pupils transferred to other schools locally. It did however have a high "contextual value added" (CVA) score, indicating how much progress the children had made since joining it. Its CVA of 1041 - the measure is centred on 1000 - put it in the top 5% of schools nationally. The best at this level was Park Community School in Havant, Hampshire, on 1084.5. Pupil Oliver, 13, said: "The school has improved, and now we're top of the list, all we have to do is keep up the excellent work, and continue to be brilliant!" Deputy head teacher Bob Carter said: "I am not only really pleased for the school, but also for the community. It is such an achievement." Independent schools also appear to do badly - because increasingly they choose to enter their pupils for International GCSEs (IGCSEs) in English and maths. These are not accredited by the qualifications watchdog so do not count in the government's tables. The chief executive of the Independent Schools Council David Lyscom said this made the tables "misleading and inaccurate". 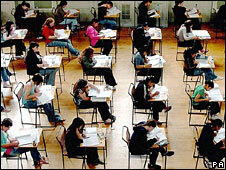 "League tables should reflect the reality of the exams that children actually take. Until this happens we cannot see how the tables can provide parents or teachers with any helpful guide as to the performance of ISC schools." The results this year include a new indicator showing what percentage of pupils attained the equivalent of A*-C in one full modern foreign language GCSE. Nationally the average was 30.7%. The biggest innovation in the tables is the introduction of a post-16 CVA measure, for sixth forms and colleges. This is calculated differently from the one at GCSE-level and does not take into account such things as deprivation and ethnicity. At the top on 1102.7 was Hurtwood House, an independent school in Surrey, while students at at Cleveland College of Art and Design in Middlesbrough on Teesside were next with 1078.1. On the more conventional A-level measure of average points per student, top this year - as last - was Colchester Royal Grammar School, Essex. Its students averaged 1359 points. The core GCSE results provoked a political argument. The government has a target to increase the proportion achieving five A*-C grades (and equivalent), including GCSEs in both English and maths, to 53% by 2011. England's Schools Secretary Ed Balls said this should be met. "This is no time for excuses - I want every child to go to a good school and that means every school getting above 30%." But his Tory shadow Michael Gove said: "Ministers are failing to deliver their promises on education." Teachers' unions have repeated their opposition to the publication of schools' results and "absurd" targets. Chris Keates of the NASUWT said: "It is regrettable that a government which has made so many improvements in education clings to this unnecessary, divisive and demoralising annual ritual. League tables should be abolished."